Nicole is a clinical psychologist and Army Combat Veteran with a passion for community collaboration in service of promoting the mind health of our veterans, their families, and the Charlotte community. Nicole was a recipient of the military Health Professions Scholarship in 2003 and completed nine and a half years of active duty service across the globe after earning her doctoral degree at Rosemead School of Psychology in La Mirada, CA. She is inspired by recent findings in interpersonal neuroscience which offer considerable hope and advanced understanding of our biological capacity for healing and transformation. These findings influence the way she lives and practices her profession. Patrick Hayes, MSW, LCSWA joined Veterans Bridge Home in July 2017, after completing his Masters of Social Work at the University of North Carolina at Charlotte. During his time at UNC-Charlotte Patrick completed field placements with the Urban Ministry Center in Charlotte and the W.G. (Bill) Hefner VA Medical Center in Salisbury, NC. Prior to becoming a Social Worker Patrick served in the U.S. Army as a Logistics Officer for seven years, and continues to serve in the U.S. Army Reserves. He was commissioned through Officer Candidate School at Fort Benning, Georgia, and attended the Ordnance Officer Basic course at Aberdeen Proving Grounds, Maryland. Patrick was stationed in North Carolina and Virginia and deployed to Afghanistan in Support of Operation Enduring Freedom. Bryce is a Charlotte native. He moved away while he attended college at The Citadel where he earned a Bachelor’s Degree in Psychology. After graduation Bryce moved back to the Charlotte area where he began working with under privileged youth and youth in crisis as a Crisis Counselor for an emergency shelter called The Relatives. Bryce then transitioned to Carolinas Healthcare System where he worked in the behavioral health field before beginning with Veterans Bridge Home as a Care Coordinator in November of 2016. Bryce’s passion for working with veterans stems from having strong military ties in his family as well as from his time at The Citadel. Working with Veterans Bridge Home Bryce has been able to follow his passion to serve those who have served. 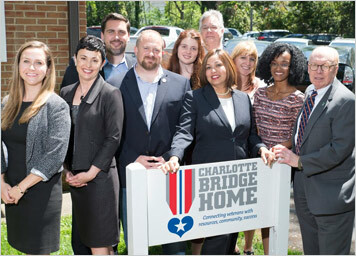 Veterans Bridge Home was competitively selected as the Coordination Center for the Charlotte area in May of 2015 due to the organizational experience in serving military and veteran families by leveraging existing local community-­based resources. Veterans Bridge Home works to successfully transition Veterans home after military service by identifying their individual needs & goals and connecting them to available community, state and federal resources. Our Coordination Center supports over 40 local organizations and 125 different practitioners in order to leverage the best­-in­-class local resources available to our military and veteran families. AmericaServes kicked off NCServes­ - Metrolina on August 1st, 2015.